Young activists in New Jersey and New York join those around the world, skipping school and organizing and attending events to demand accountability and action on climate change. Students at Montclair (NJ) High School walked out of school for a #YouthClimateStrike. 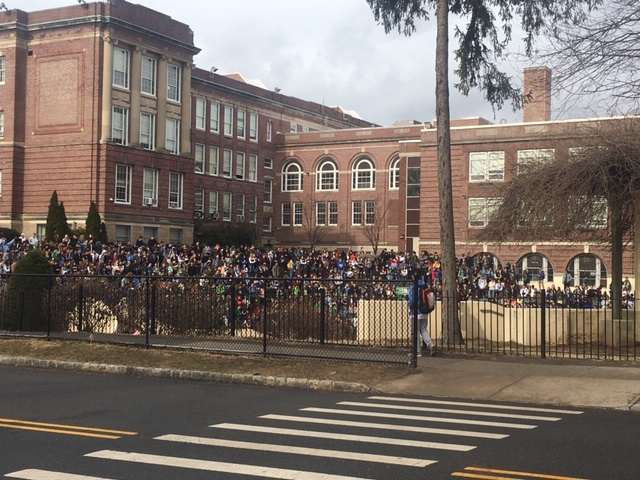 In Montclair, NJ, high school students walked out of the classroom buildings to the amphitheater on campus and cheered speakers discussing the urgency of the issue. 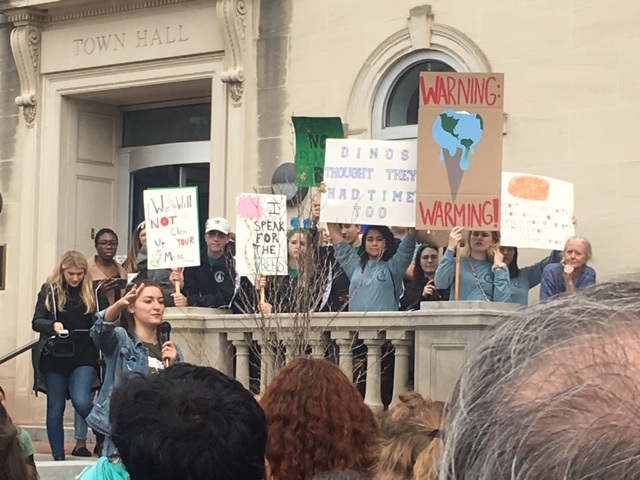 "We strike globally because of the lack of governmental action to fix climate change," said student Saumaya Schneider, who was one of the organizers of the Montclair High School event. Not far away in Morristown, people gathered in front of the town hall building. The event began with what was meant to be a simple organizational instruction but summarized the entire day when a high school student took the microphone and asked the adults to move to the back and allow the young people in attendance to step forward. When the speakers began officially, they listed the reasons for being there to pressure local, state and federal government take action and gain media attention to their cause and their demands, which included the Green New Deal, a halt in fossil fuel infrastructure projects, policy decisions based on scientific research, a national emergency declared on climate change and, "compulsory, comprehensive education on climate change and its impact." "Career politicians, corporations, and billionaires with savvy PR teams will tell us we are being too demanding, too unrealistic," one of the speakers, 16-year-old Eden Summerlin told the crowd. "They will tell us we are being too loud, too disruptive, and too disobedient. They will tell us that we are disturbing the social order, asking for things we will not receive and wasting their time complaining about issues we don’t understand. Across the Hudson River in New York City, hundreds of young activists gathered at Columbus Circle and marched up Central Park West to the American Museum of Natural History where they held a die-in. While the rally early in the event, which began in the shadow of Trump Tower, included some political chants opposed to the president, it was a bipartisan bashing once they got to the steps of the museum. Young people dressed as president Donald Trump and fellow Republican senator Mitch McConnell, as well as Democratic senators Dianne Feinstein and Chuck Schumer were there to be in the museum to be with the other dinosaurs, speakers said. From left: #YouthClimateStrike in NYC marches up Central Park West to the American Museum of Natural History; Sign at #YouthClimateStrike in Columbus Circle in New York City. The event was organized by one of the Climate Strike U.S. co-leaders, Alexandria Villasenor, who has been holding her own Friday climate protests at the United Nations for months. Villasenor was one of the global youth leaders who joined Thunberg in writing an editorial that ran in The Guardian today. "So today we walk out of school, we quit our college lessons, and we take to the streets to say enough is enough. Some adults say we shouldn’t be walking out of classes that we should be “getting an education”. We think organising against an existential threat and figuring out how to make our voices heard is teaching us some important lessons. "Other adults keep saying: 'We owe it to the young people to give them hope.' But we don’t want your hope. We don’t want you to be hopeful. We want you to panic and we want you to take action. 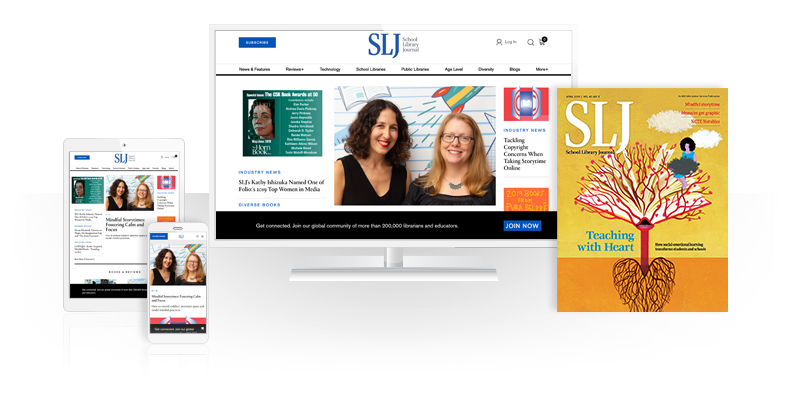 We want you to join us."